BOSTON, June 1, 2016 /3BL Media/ – Two-thirds of American employees feel their work and personal life are becoming increasingly blended and nearly all (93%) want to work for a company that cares about them as an individual, according to the 2016 Cone Communications Employee Engagement Study. The study reveals an increased expectation for companies to provide not only basic benefits but also ones that allow employees to bring their passions for social and environmental issues to the workplace. Employees today want it all. In addition to traditional benefits, such as affordable and quality health insurance (94%) and a competitive financial package (92%), employees are seeking more contemporary benefits. In fact, employees say opportunities to support causes or issues they care about (64%) is as important as wellness programs (69%) or tuition reimbursement (66%). Beyond benefits, more than three-quarters (78%) say they want to be an active participant in helping their company improve its responsible business practices by providing feedback, ideas and potential solutions. The notoriously transient mature Millennial segment, aged 27-35, is significantly more likely to view CR as a key factor. Two-thirds say they won’t work for a company that does not have strong CR commitments (vs. 51% U.S. average); and once hired, they are more likely to be loyal (83% vs. 70% U.S. average) when they feel they can make a positive impact on issues at work. Retention among this highly sought-after employee base has huge implications for business. When it comes to volunteering at the workplace, traditional opportunities still lead the way. Employees look to companies to provide turnkey ways to participate in volunteerism through company-wide days of service (67%) and corporate-led activities throughout the year (67%). However, more than half of employees are looking toward more progressive volunteer models, such as micro-volunteerism (63%) and paid service leave (61%), as well as a strong desire to engage through after-hours opportunities (58%). Preferred engagement varies based on different demographics. Although both men and women prioritize corporate-led activities, men are more willing to make a greater time commitment to volunteerism through paid service leave (67% vs. 56% women), after-hours service opportunities (60% vs. 55% women) and service trips (59% vs. 48% women). Employees also want to flex different muscles in applying their time and energy to worthy causes. Although much attention is given to a newer skills-based volunteer approach, only a quarter of employees say this is their preferred type of engagement. Over half (53%) prefer a blend of skills-based and non-skills-based activities, and nearly a quarter prefer to leave their workplace skills at the office (23%). Employees don’t want to look too hard to find information on engagement opportunities. Companies should leverage tried and true communications channels to reach employees where they are looking. Employees prefer to learn about opportunities through internal email or newsletters (43%), management (38%) or collateral or events at their place of work (31%). A quarter of employees also see newer methods, such as intranets or customized portals (27%) or employee ambassadors (23%), as priority channels. 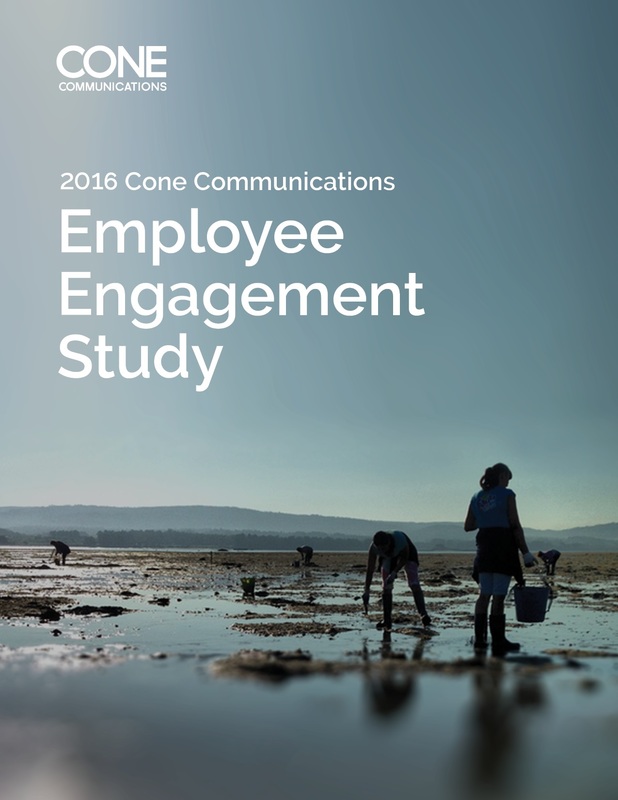 The 2016 Cone Communications Employee Engagement Study presents the findings of an online survey conducted April 11 – 20, 2016 by Toluna among a random sample of 1,020 adults, employed at companies with 1,000 employees or more, comprising 510 men and 510 women, ages 20+. The margin of error associated with a sample of this size is ± 3% at a 95% level of confidence. Cone Communications (www.conecomm.com) is a public relations and marketing agency that is Always Making a Difference℠ for business, brands and society. With a unique combination of corporate responsibility, consumer brand and integrated marketing expertise, our people deliver emotional storytelling and business value for every client. Cone is part of the DAS Group of Companies, a division of Omnicom Group Inc. (NYSE: OMC), a global group of marketing services companies.